Every aquarium owner has to go through the often painful process of getting a new aquarium cycled. Most of us have said to ourselves at some point, "Is there any way I can speed this up, or better yet, just avoid it entirely?" Unfortunately, there is no way to instantly establish a stable nitrogen cycle in a new aquarium. However, there are ways to shorten the process and to relieve stress on the fish. 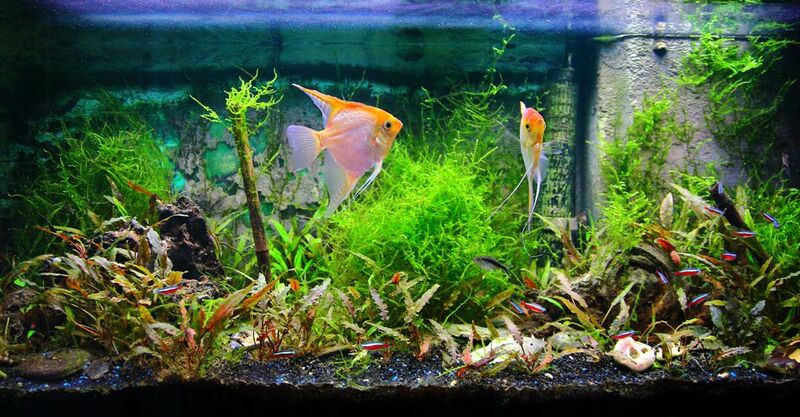 There is understandably a lot of buzz about this method because it doesn't require fish in the tank at all, and therefore no fish can be lost. And it does work - as long as you are willing to spend the time making it work. I was somewhat skeptical of this method at first, probably because I'm an 'old-timer' in the hobby and accustomed to using the time-honored methods. After trying it, I became something of a believer. As long as you follow the steps, it will work. Picking up on a theme there? Always follow steps. Fishless cycling accomplishes the same thing as starting a tank with fish in it. The difference is that ammonia is added to the tank to replicate the waste that would be produced by the fish. The key is testing and adding ammonia daily to keep the process going. Miss some days, and your colonies will not continue to grow. In fact, they may die off, and you'll have to essentially start over. Fishless cycling will not instantly 'cycle' the tank. Just as the standard methods of establishing biological colonies in an aquarium take time, so does fishless cycling. However, it usually takes less time and is certainly easier on your fish. Seeding an aquarium is an age old method for jump starting the biological colonies in a new aquarium. A cup of gravel from a stable, established tank is placed in a bag and put into the filter. Another option is to take the foam insert from an established filter and place in the new filter. Yet another option is to take the ceramic rings from an established canister filter and place in the new filter. In all these examples, there are cautions to observe. First and foremost, make sure the source of your 'seed' is from a healthy tank. If there has been any disease recently in the tank the gravel or filter media comes from, don't use it, as you may be transferring unwanted pathogens. It is also important to transfer the seed media promptly, or the bacteria will be shocked and die off. Also, do not use seed material from an aquarium that has drastically different water parameters than the new tank. The pH should be a similar range, meaning don't transfer something from a tank with hard alkaline water to a tank that has soft acidic water. The bacteria may very well all die off, and you will be causing more problems than you are solving. Have the new tank set up and ready to go, ensuring the water temperature and pH are stable and in the desired range. Transport the gravel or media in water from the tank it came from, so it is not exposed to the open air. Fish should be added to the tank very shortly thereafter, otherwise the bacterial colonies will not have a continued source of ammonia. Another method to speed up the process is to place the filter that will be used in the new tank on an established tank and let it run side by side with the existing filtration system. After a week or so, the new tank can be set up and the filter moved to it, bringing with it biological colonies that are already growing. Fish should be added the same day, to ensure the cycle continues. This doesn't eliminate the cycling, and care should be taken not to stock the tank too heavily at first. However, it will reduce the amount of time the overall process takes in the newly set up tank. Regardless of the method used, there is no magic bullet that immediately establishes robust biological colonies, and allows the tank to be fully stocked without any side effects. Yes, the cycle can be shortened, in some cases significantly. But testing the water and performing regular maintenance is still essential to ensure the tank is stable and can safely support the fish. Never add a large number of fish all at once, even if you think the tank is fully cycled. As the saying goes, slow but sure will win the race.